Y’all, Quilt Market was a blast. This was only my second trip–I went in Spring 2009 in Pittsburgh, but that fall was our famous flood and this past spring our baby was two weeks old, so this trip to Houston was the soonest I was able to make it happen. And SO MUCH has happened in between the two visits that I can hardly believe it! Not only was I able to go promote my very own book–a dream beyond imagining, and super, super fun–but I was able to connect with so many amazing friends who I would never have met, and who I’m so delighted to see again. 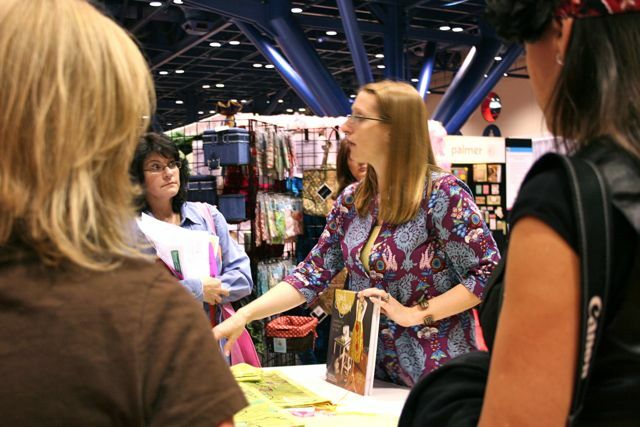 The book signings were insane amounts of fun–I started with a Schoolhouse session where I had the chance to talk to shop owners from all over about using Stitch by Stitch to create workshops and classes for their stores. I wrote the book based on the classes I’ve been teaching here in Atlanta for the past four years, and honestly, really believe that it is THE best way to learn to sew: one project at a time, with motivation to continue and the instant gratification of super cute projects as you go along. Talking about that with a whole bunch of other shop owners who have the same passion as I do was a totally different way of thinking about the book, and was a real challenge. I didn’t exactly know how to do it at first, and had to do some rewriting before I hit the room. 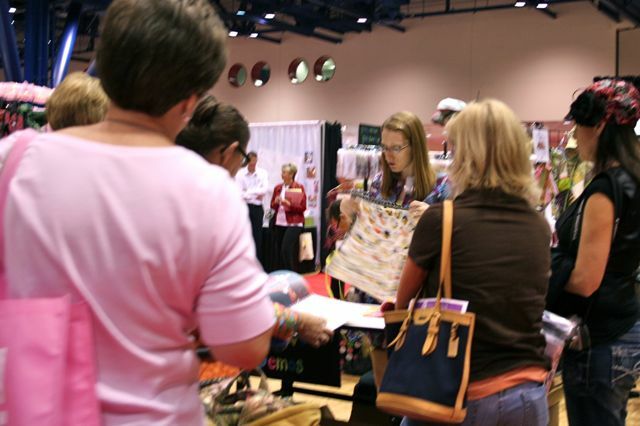 Bottom line: I think that leading others to passionately love sewing is the reason I’m on this planet, and it’s my mission statement, so I want to make it possible for that to happen in as many formats and as many venues as I can, including working with other shop owners to develop classes at their own stores. More sewing for everyone! I got to do demos of some of the projects, too, the following day out on the convention floor. It’s wild to be out in the middle of literally thousands of people, acres of booths, deafening excitement, and talk about a book that I wrote while demonstrating projects I designed. It’s humbling and exhilirating and nerve-wracking and seriously, very cool. There was a great turn-out for each of the signings, and we gave away copies of the book to those who came out–I really enjoyed getting to meet shop owners from Australia and Iowa and Texas and Canada, and hear more about what they do where they are. Many of them are quilt shops, where they have traditionally done quilting exclusively, and I’m hoping that they’re heading back to their hometowns thinking of ways that they can serve those of us who don’t come to sewing as quilters but who really want to be part of this world. 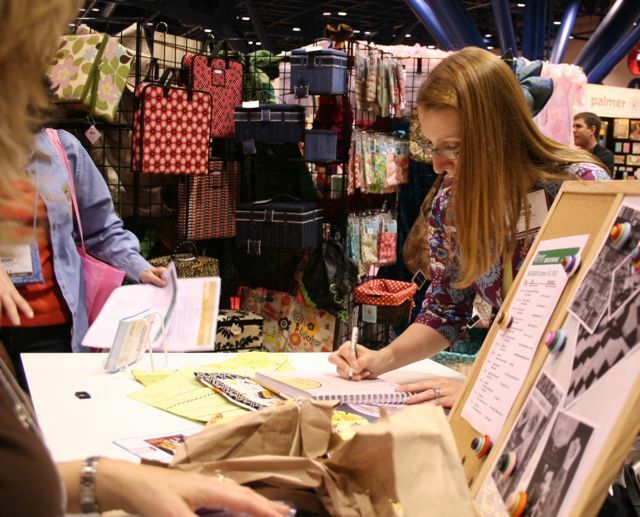 That was the other major thing I noticed, and the biggest difference between this Quilt Market and the one I attended a year and a half ago: the growth in the industry is staggering, and the new design sense, the movement toward a more modern aesthetic, the new products available for younger stitchers–it’s almost overwhelming, and I nearly peed myself, I was so happy to see it. 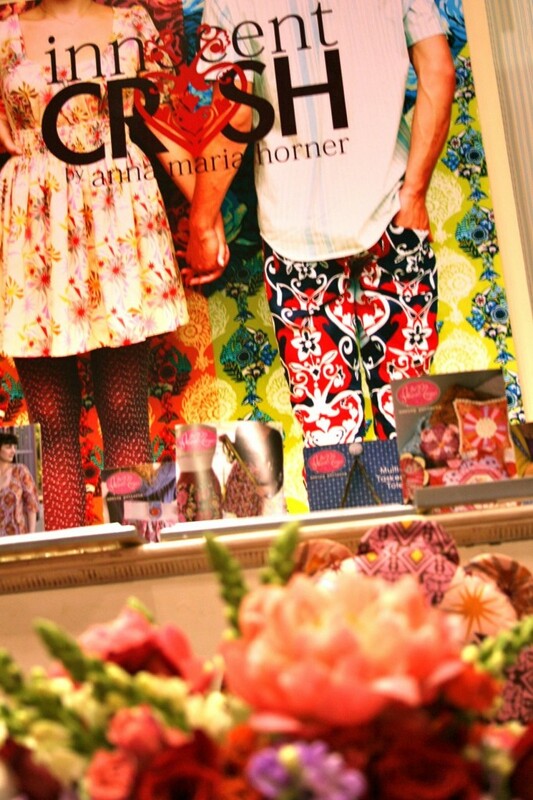 I got to catch up with one of my faves (and my not-so-secret crush), Anna Maria. I took a leap and wore my Schoolhouse Tunic which I’d made from her Innocent Crush–a little on the stalker-y side, but it’s such a sweet pattern and such a gorgeous print that I felt insanely pretty, and I wanted that confidence to spill over into my talks. When she saw me, she said, “Perfect! OK, you just go stand over there in the booth, and, y’know, stay there!” We laughed and I got to pretend I wasn’t a crazy lady who’s been lurking on her blog for years. It was awesome. 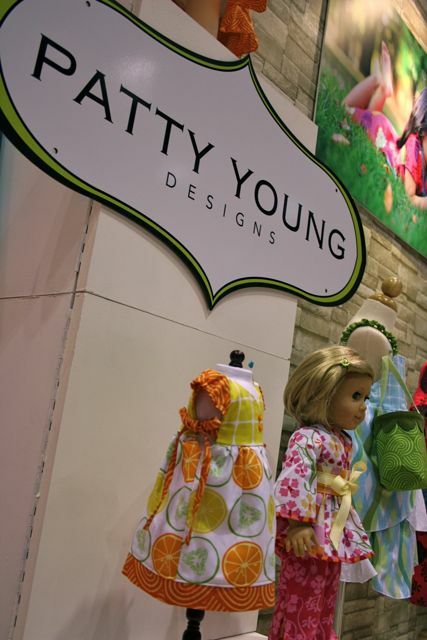 I checked in with the fabulous Patty Young, too, and her husband Jon, with their ModKid designs. 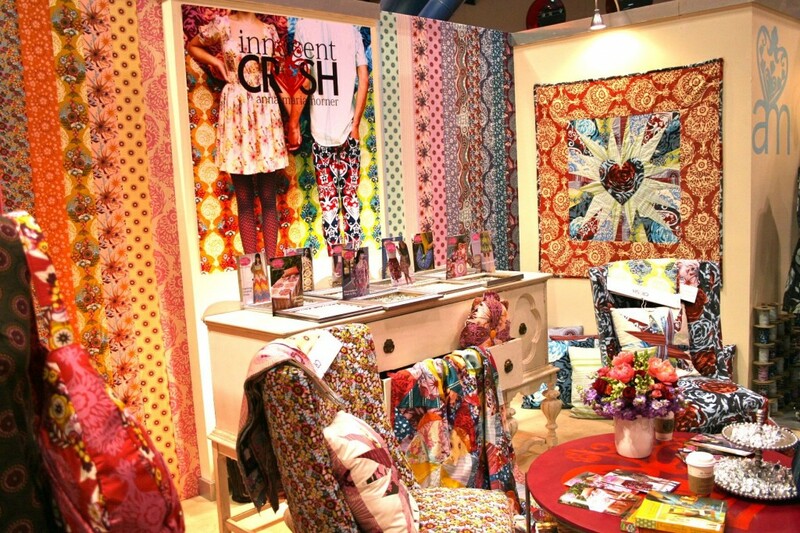 Patty had a Vision for their booth this year, and it was so light and clean and fun–you wanted to be in it for as long as you could. 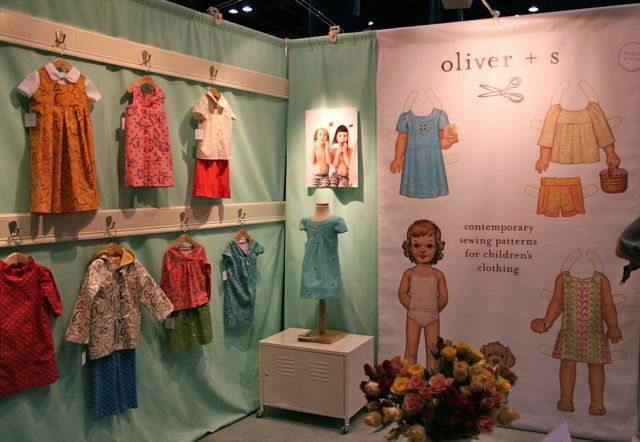 I love that they’re working hard to bring more for kids and for women in terms of patterns and fabrications on the market, and am excited to see their new stuff hitting shelves! I wouldn’t have done justice to my trip if I hadn’t stopped by and visited with Liesl Gibson of Oliver + S. I just adore her, and the more I talk to her the cooler she becomes in my eyes–I heard her described as the most down-to-earth person in all of Manhattan, her and her husband both, and I think that’s a totally accurate statement. We ran into one another in the vintage button booth later and got a little geeky about the buttons–she’s just as lovely as you’d expect, and so smart and so passionate and so insightful about the industry. Very cool folk. There was so, so much more! So many things I didn’t get photos of: the Fabric 2.0 party where I finally got to see the always-darling Lizzy House in person (and let me tell you: wise beyond her years doesn’t begin to describe her, and lovely, and smart, and witty, and confident, and…fabulous, just fabulous) and meet the delicious Marisa of Creative Thursday (who is some kind of soul mate–why have we not met before?? What up with that, yo? ); the Cake Party that Lizzy throws every year, where I spent some quality time with Melody Miller and her right-hand-girl Allison (they’re launching Ruby Star Rising, which will be in the shop in its entirety in a very few weeks–preview tomorrow, cause you’re gonna wig out, it’s so awesome); picking up buttons (BUTTONS!!!) for the shop–both modern and vintage, and all awesome (you’ll never have to shop anywhere else again! ); visiting with other online shop owners (like the adorable Lindsey and Charlie of Hawthorne Threads and the ladies of Lola Pink Fabrics); checking in with my publisher and dropping distinctly-unsubtle hints that I’m dying to write another book; getting wildly inspired to design and sew and quilt and write and explore and see things anew; and touring the streets of Houston with my sweet husband (who was kind and chivalrous and generous and thoughtful and who bravely bore the burden of being my valet and chief baby-minder all weekend long). I’ll share some play-by-plays tomorrow, but for today: I’m pooped! Plenty of work to do to get the e-course moving forward for the week, and new November classes going at the shop. Looking forward to a quieter Market in Salt Lake next May, but still basking in the enjoyment of Houston. If I didn’t name your name here, please know that you were part of a very, very cool experience for me, and that it all added up to an amazingly exciting, inspiring whole! Sounds like a truly wonderful time. What a treat! What a whirlwind! Sounds so fun!! Is that the innocent crush shirt you’re wearing? It’s so pretty! That sounds like an awesome time. Wow I would love to meet those ladies. Soooo….when are those buttons gonna be in your shop? I may have to leave work early one day just to come and check them out…..And YAY for another book. Stitch By Stitch is great – I want more!! It was! Next year, you should totally come with us–we’ve got room!